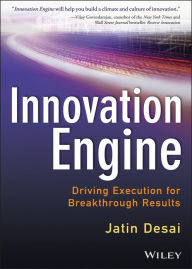 DeSai has made a big impact on our organization, helping us change our culture and giving our people the understanding and tools they need to drive innovation and results." DeSai's Leadership Development services are designed to help skilled individuals become more effective leaders and adopt the behaviors necessary to sustain a climate that supports innovation. It is offered on an individual basis and is part of our Innovation Execution Methodology. This individualized development process builds a leader's capability to achieve short and long term innovation goals. Our Innovation Consultants work in partnership with executives and help develop innovation competencies used to solve real business challenges. Over the years we have worked with many great leaders, and a few that might not be described in that way. What we have noticed is that there are consistent behaviors exhibited by those that we would describe as "Great Innovation Leaders". Today's business environment is demanding innovation and demanding leaders that can encourage it within their climate. Our coaching framework is designed to help leaders embed these behaviors deep into organizational cultures. Collaboration - Internally and externally - a leader's ability to work with other stakeholders within and outside their organization provides advantages not realized by leaders less inclined to engage others in their work efforts and idea generation. Customer Focus - many leaders have lost the perspective of who their customer/s are. Integration with your customer, internal or external, and an understanding of their needs provides a wealth of information and direction not accessible by leaders focused only on their own responsibilities that are not overtly connected to the customer. Quick & effective decision making - Great leaders make decisions quickly, and effectively - often because they are involved and informed about the matters they are deciding. This also typically indicates a leader that has delegated the decisions that they are not as informed or engaged with to people who can make a better, faster decision. Embrace Change - Great leaders know that the current environment is providing reasons and mandates for change every day. If a leader is unwilling to continually adapt to the changing environment, it impedes the very nature of innovation. Recognize and learn from failure - Great leaders are transparent about mistakes, learn from them and share the learning's with others.